The Biochemical and Biophysical Systems Group is formed by experimental and computational biologists who use a wide range of expertise to approach cutting-edge problems in systems biology. We use multidisciplinary approaches – ranging from molecular biology through proteomics to modeling – to investigate microbes and microbial communities as they respond to different perturbations, including those relevant to emerging issues in bioenergy and pathogenesis. In addition to developing computational tools to describe and predict biological systems, we are combining experimental efforts with modeling and simulation methods to design and develop safe and effective therapeutics. Our principal unifying objective is to gain a predictive understanding of protein-mediated activities that are critical to cells and their interactions in living systems. Molecular dynamics (MD) simulations show that ion channels in cell membranes are resistant to damage by shock waves. But when voids ("bubbles") are present, for example, in the extra-cellular fluid, shock-wave-induced void collapse creates nanojets that could cause significant damage to the ion channel. Such damage can contribute to an electrolyte imbalance within nerve cells that can lead to the initial symptoms of TBI, such as headaches and seizures. Previous experiments and molecular simulations of void-shock interactions have shown that the force generated by void collapse is great enough to cause pores to form in membranes, known as poration. Such pores, however, quickly self-heal, likely avoiding unregulated ion exchange through the membrane that can lead to a cascade of events that cause injury and ultimately neuronal death. But shock-wave-induced void collapse can have adverse effects on membrane-bound ion channels even when poration does not occur. In contrast to the effects of poration on a simple (lipid-only) membrane, the damaged ion channels may not readily self-heal. See Shock Wave-Induced Damage of a Protein by Void Collapse, E. Y. Lau, M. L. Berkowitz, E. Schwegler (2016) . Biophysical Journal, 110, 1, 147–156. Glutamate Receptors are key neuroreceptors in the brain that have been linked to a number of major neurodegenerative diseases. They are massive, multi-domain, membrane-embedded proteins. Their sheer size and complexity makes them an ideal subject for simulation using Lawrence Livermore National Laboratory's world-class supercomputers. The ligand-induced closing actions of the ligand-binding domains of Glutamate Receptors determine the opening pathway of the receptor channel. By studying how these conformational pathways progress, we can investigate possible intermediate states that may exist, and probe potential target sites for drug design. ligand-binding domains are situated just above the membrane. These two animations show two possible pathways for the ligand-binding domains to "close" around a ligand (which is not shown). The first pathway has the lower lobe smoothly moving up to contact the upper lobe, while the second pathway incorporates a slight twisting motion of the lower lobe as it closes. Ongoing research explores the relative energetics of such alternative conformational paths with molecular dynamics all-atom computer simulations. Neurotransmitters convey signals from one neuron to the next and are indispensable to the functioning of the nervous system. These small molecules bind to receptors to exert their action. One of the most important neurotransmitters is gamma-aminobutyric acid (GABA), which binds to its type A receptor (GABAA-receptor) to exert an inhibitory influence on the neuron. Many drugs, both medicinal and nefarious, bind to these GABAA-receptors and alter the balance of neuronal signals in the brain. There is a fine balance between these drugs eliciting the desired effect, and causing unwanted and sometimes irreversible alterations in neural behavior. The average GABA binding pathway illustrates the narrowing of the standard deviation of GABA molecule positions as the molecule approaches the binding site. Each disk is centered at the average GABA position at that distance from the binding site (red circle). The disk's diameter is proportional to the standard deviation of the GABA position at that distance. The disks are oriented with their axes intersecting the binding site. The ligand-binding domain of the receptor is shown in gray. 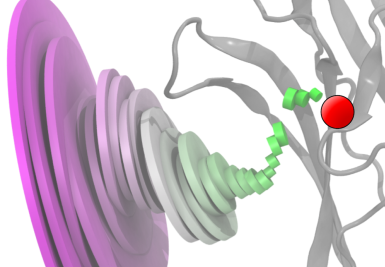 To study this critical binding event, we used many molecular dynamics computational simulations to observe precisely how the GABA molecule binds to GABAA-receptor. 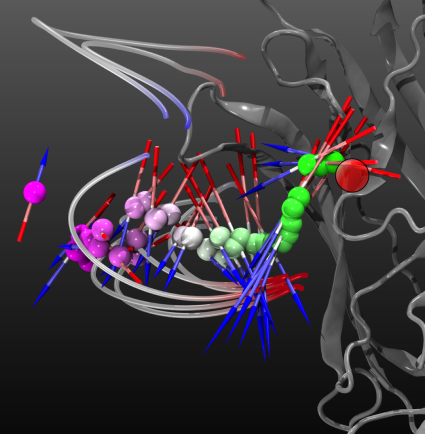 One hundred individual simulations were carried out where GABA was placed near the binding site and then allowed to freely bind to the GABAA-receptor. Binding occurred in 19 of these simulations. Statistical analysis of these binding simulations reveals the consistent electrostatics-driven pathway taken by GABA molecules to enter the binding site. Improved understanding of binding events enables the development of safer medicinal neuroactive drugs and countermeasures for effects of neuronal chemical trauma. See An Electrostatic Funnel in the GABA-Binding Pathway Timothy S. Carpenter and Felice C. Lightstone PLoS Comput. Biol. (2016) 12(4): e1004831. The average dipole experienced by GABA molecules as they follow the binding pathway indicates that the molecules are aligned in the protein’s electrostatic field. The orientation of the average dipole of the GABA molecules at that distance from the reaction site (red circle) is represented by an arrow, with the length of the arrow proportional to the strength of the average dipole. Blue-gray-red "filaments" show selected electric field-lines. Figure 1. The initial fragment hit, bound to E. faecalis GyrB. The coloring of the GyrB enzyme indicates residue conservation across members of the GyrB evolutionary family; green regions are identical across members, yellow are conserved regions, and red are variable/non-conserved regions. The increasing spread of bacterial strains that are resistant to current antibiotic drugs is a serious problem. Structure-based drug design using high-performance computing has helped create the first new class of antibiotics in 30 years. This promising drug candidate has broad activity and effectiveness, and in addition, will hamper the evolution of resistance among its bacterial targets. A number of important antibiotics target the bacterial topoisomerases DNA gyrase (GyrB) or topoisomerase IV (ParE), which are essential enzymes that control the topological state of DNA during replication. The effectiveness of these drugs, however, is being lost due to the spread of drug-resistant bacterial strains. While disabling either GyrB or ParE will kill the bacterium, a “dual-target” drug, which disables both enzymes, is less likely to succumb to drug resistance because two independent advantageous mutations would have to occur simultaneously in a bacterium in order for it to survive. Figure 2. Chemical structure of initial fragment. Figure 3. Scaffold of the molecule, with potential R groups labeled. Development of the candidate antibiotic began with the identification of a molecular fragment that weakly disrupts the activity of both the GyrB and ParE enzymes through its interaction with GyrB and ParE inhibitory binding pockets. The fragment binds to the pocket as Figure 1 shows with GyrB from E. faecalis. The scaffold of this fragment has several R groups that can be modified or added; Figure 2 shows the chemical structure of the fragment, and Figure 3 shows the scaffold with R groups labeled. The R groups interact with the GyrB binding pocket in different ways, as Figure 4 shows. Figure 4. View of the binding pocket surface. The potential hydrogen-bonds between the molecule and conserved adenine-binding aspartate and structural water molecule are shown. The R5 and R6 groups face the active-site pocket interior, while the R2 and R4 groups are directed towards partially solvent-exposed faces of the active-site pocket. Potential R-group modifications were first explored with virtual screening, computational molecular dynamics simulations, and free-energy calculations, as well as quantum mechanical calculations, of the candidate drug molecules. Modifications that would produce increased affinity of the drug to GyrB and ParE were identified; the best of these were synthesized and tested in vitro. High-performance computing enables the quick turnaround of high-quality, compute-intensive calculations. This was important because of the short development cycle – test, modify, test – involved in this effort. Many, many alternatives were considered. Timely computer-based screening of options helps focus development efforts and helps to minimize costly wet-lab expenditures, such as drug synthesis. Alternatives explored included substituents in three distinct regions of the active-site pocket: (i) the lipophilic active-site interior, along the R5 and R6 group vectors, (ii) the salt-bridge pocket, along the R2 group vector, and (iii) the residues and ordered solvent network at the mouth of the lipophilic pocket, along the R4 group vector. Filling the lipophilic pocket interior via installation of an ethyl group at R6 and a small substituent at R5 resulted in drug molecules with potencies two to three orders of magnitude greater than that of the initial fragment. Particular attention was paid to optimizing the dual-targeting capabilities of the drug molecule, that is, affinity for both GyrB and ParE, while also minimizing potential off-target activity. Thus, this drug development effort used high-performance computing to explore structure-based inhibitor design against multiple members of the target protein family, resulting in an inhibitor series with exquisite potency, broad enzymatic spectrum, and dual-targeting activity. The series is highly ligand-efficient, and tolerates significant chemical diversity at two R-group locations without compromising enzyme potency and spectrum. Taken together, these features greatly improve the prospects for developing molecules with antibacterial activity and good drug-like properties. See L. W. Tari, X. Li, M. Trzoss, D. C. Bensen, Z. Chen, T. Lam, J. Zhang, S. J. Lee, G. Hough, D. Phillipson, S. Akers-Rodriguez, M. L. Cunningham, B. P. Kwan, K. J. Nelson, A. Castellano, J. B. Locke, V. Brown-Driver, T. M. Murphy, V. S. Ong, C. M. Pillar, D. L. Shinabarger, J. Nix, F. C. Lightstone, S. E. Wong, T. B. Nguyen, K. J. Shaw, J. Finn (2013) Tricyclic GyrB/ParE (TriBE) Inhibitors: A New Class of Broad-Spectrum Dual-Targeting Antibacterial Agents. PLoS ONE, 8(12): e84409.